Cook et. al (1986) called the Kamchatka region in far eastern, coastal Russia the “final frontier of plate tectonics.” Despite nearly three decades of work since then, that frontier still exists today and an active debate continues on the existence and boundaries of microplates or ‘blocks’ such as the Okhotsk Plate. The Okhotsk Plate gets its name from the Sea of Okhotsk which lies within its boundaries. It also contains the Kamchatka Peninsula, the Russian coast west of the Kamchatka Peninsula, the Kuril Islands, the eastern half of Sakahalin island, and part of northern Japan (Timofeev 2012). Below is an image from Seno et al. (1996) which represents the two competing Okhotsk plate boundaries. In one, Okhotsk extends down to the Philippine Sea Plate in central Japan (Honshu) while in the other it terminates in northern Japan (Hokkaido). 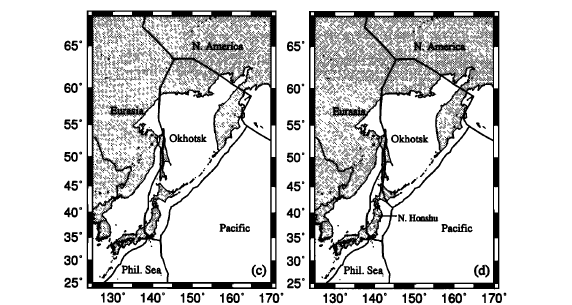 Years later, this dichotomy is perpetuated even in contemporary literature on Okhotsk plate (compare boundaries from Timofeev and Ozawa in figures below). The Mw 9.0 Tohoku earthquake in 2011 will likely make greater resolution of this plate boundary more imperative to piece together the geodynamics of that tragic event. Plate displacement vectors and magnitudes in Okhotsk plate model versus North American Model. Compare with southern boundary printed 1 year earlier to the right. With this boundary the Mw 9.0 earthquake would not have occurred along the Okhotsk (Timofeev 2012). Displacement vectors from Tohoku earthquake. Note that Ozawa's group extends the southern boundary further south than Tokyo (Ozawa et al. 2011). The Okhotsk plate lies between the North American Plate to the North and East, the Eurasian and Amour Plate to the West, and the Pacific Plate to the Southeast (Timofeev 2012). Mackey et al. (1997) support an additional Bering Block to the east between the North American Plate and Pacific Plate. Kamchatka hosts some of the most active volcanoes and is one of the most seismologically active regions in the world as well (USGS "M5.5 - 137km SE of Petropavlovsk-Kamchatskiy, Russia"). However, it is believed that the Okhotsk plate is the contemporary example of a long lineage of land masses and island arcs that have been ‘docked’ onto Asia as the Pacific Plate pushes westward. Kamchatka and the Kuril islands represent a volcanic arc composed of basalts, andesites, dacites, and rhyolites (Konstantinovskaia 2001). From seismic surveys the Okhotsk Sea Plate is believed to be composed of three layers. First the deepest layer consists of gabbroic cumulates. The second layer is composed of interbedded volcanics, sills, and sediments. Lastly, the shallowest layer represents sedimentary fill corresponding to Cenozoic depostion following the accretion of Okhotsk Plate onto Eurasia (Bogdanov and Dobretsov 2002). 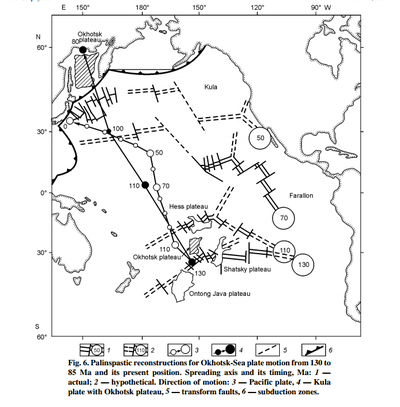 The Okhotsk Plate is interpreted to represent an old oceanic flood basalt plateau which emerged within the Kula Plate from a Jurassic to Cretaceous aged plume event. It travelled northward with the Kula Plate until it reached the Eurasian Plate some 80 mya where it in effect jammed up the subduction zone between the Kula and Eurasian Plates. Dated ophiolites in surrounding areas yield ages spanning upper Jurrasic to lower Cretaceous consistent with the invoked plume event (Bogdanov and Dobretsov 2002). Subduction of the Pacific Plate in the east has created three generations of Andean-type volcanic arcs and docked a microcontinent onto Kamchatka (Konstantinovskaia 2001). The Pacific plate is subducting along Okhotsk Plate’s eastern edge towards the northwest. Subduction varies along the length of the arc but ranges from 75 mm/year in the North to 83 mm/year in the south (USGS "M5.5 - 137km SE of Petropavlovsk-Kamchatskiy, Russia."). At the northeast edge of the plate the North American, Okhotsk, and Pacific compose a triple junction. On its western edge with the Amur Plate and Eurasian Plate, the Okhotsk Plate was subducting beneath the Eurasian plate, but subduction is currently inactive (Bogdanov and Dobretsov 2002). Movement is dominantly reverse and dextral strike slip along the Sakhalin-Hokkaido fault between the Amurian Plate and the Okhotsk plate. Jin et al. (2007) modelled convergence along this boundary ranging from 9 to 17 mm/yr at the southern tip later continuing into the solely dextral strike slip Ketanda fault system striking north (Timofeev 2012). 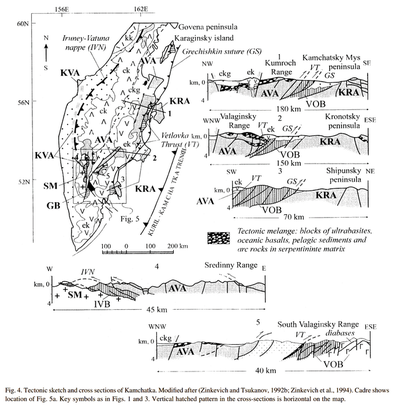 Kogan (2000) using seismic solutions measured convergence rates of 5 mm/yr to the west along the Amurian-Okhotsk plate boundary passing through Sakhalin. Apel et. al (2006) determined through gps recordings and block modelling that the with respect to the North American Plate, the Okhotsk Plate is rotating 0.231 deg/Myr clockwise. Four triple junctions exist along the Okhotsk plate, but the southern ones depend largely on how far south the Okhotsk truly extends. In the northeast corner of the plate, Okhotsk, North American, and Pacific plate meet to form a triple junction. Another triple junction is present in the northwest between Okhotsk, Eurasian, and North American as well. Hindle et al. (2006) have studied this northwestern triple junction in detail. 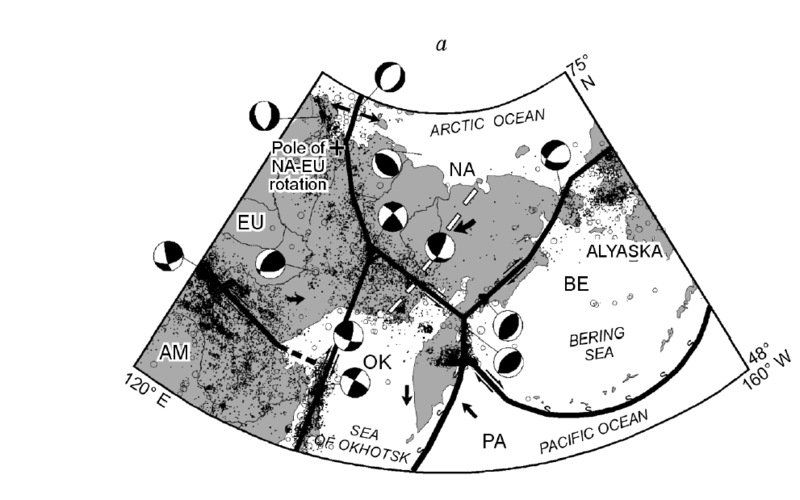 The collisional nature of the Eurasian and North American boundaries squeezes the Okhotsk plate and causes it to not only contract, but also extrude. This extrusion occurs to the southeast at a rate of 3-5 mm/yr (Hindle 2006). Coastal neotectonics-- a tectonics subdiscipline concerned with recent crustal movements expressed in recent rock record-- presents compelling evidence for plate extrusion in the east where convergence of the Pacific Plate and probable Bering Block is occurring. Researchers examined Quaternary aged marine terraces along the northern Kamchatka peninsula that convey extrusion of 0.1 - 0.3 mm per year (Pedoja et al. 2006). This plate configuration complicates modelling and the complex motions along Okhotsk boundaries cannot be reconciled by a single plate model--that is, neither pure extrusion nor pure contraction (Hindle 2006). Apel, E. V., R. Bürgmann, G. Steblov, N. Vasilenko, R. King, and A. Prytkov. "Independent active microplate tectonics of northeast Asia from GPS velocities and block modeling." Geophysical research letters 33, no. 11 (2006). Cook, David B., Kazuya Fujita, and Cindy A. McMullen. "Present-day plate interactions in northeast Asia: North American, Eurasian, and Okhotsk plates. "Journal of geodynamics 6, no. 1 (1986): 33-51. Jin, Shuanggen, Pil-Ho Park, and Wenyao Zhu. "Micro-plate tectonics and kinematics in Northeast Asia inferred from a dense set of GPS observations. "Earth and Planetary Science Letters 257, no. 3 (2007): 486-496. Kogan, M. G., R. Bürgmann, N. F. Vasilenko, C. H. Scholz, R. W. King, A. I. Ivashchenko, D. I. Frolov, G. M. Steblov, Ch U. Kim, and S. G. Egorov. "The 2000 Mw 6.8 Uglegorsk earthquake and regional plate boundary deformation of Sakhalin from geodetic data." Geophysical research letters 30, no. 3 (2003). Konstantinovskaia, E. A. "Arc–continent collision and subduction reversal in the Cenozoic evolution of the Northwest Pacific: an example from Kamchatka (NE Russia)." Tectonophysics 333, no. 1 (2001): 75-94. Mackey, Kevin G., Kazuya Fujita, Larissa V. Gunbina, Valentin N. Kovalev, Valery S. Imaev, Boris M. Koz'min, and Ludmilla P. Imaeva. "Seismicity of the Bering Strait region: Evidence for a Bering block." Geology 25, no. 11 (1997): 979-982. Ozawa, Shinzaburo, Takuya Nishimura, Hisashi Suito, Tomokazu Kobayashi, Mikio Tobita, and Tetsuro Imakiire. "Coseismic and postseismic slip of the 2011 magnitude-9 Tohoku-Oki earthquake." Nature 475, no. 7356 (2011): 373-376. Pedoja, Kevin, Joanne Bourgeois, Tatiana Pinegina, and Bretwood Higman. "Does Kamchatka belong to North America? An extruding Okhotsk block suggested by coastal neotectonics of the Ozernoi Peninsula, Kamchatka, Russia." Geology 34, no. 5 (2006): 353-356. Seno, Tetsuzo, Taro Sakurai, and Seth Stein. "Can the Okhotsk plate be discriminated from the North American plate?." Journal of Geophysical Research 101, no. B5 (1996): 11305-11.